Being in Ushuaia we were thisclose to Antarctica — relatively speaking. Being in Ushuaia is still a good five days out by sea from the elusive continent. Those five days are in good weather, which even in their summer is not guaranteed. You could purchase a last-minute cruise most anywhere around town. They leave tomorrow, or the next day, cruises were offered at discounted rates … again, it’s all relative. Those ‘discounts’ were still going to cost thousands of dollars. 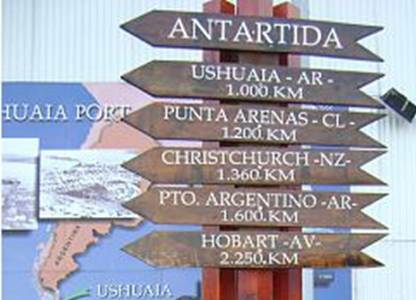 Let it be known, travel to Antarctica is not cheap – the cost for one person to cruise to Antarctica, even at this last-minute discount, would have cost more than we spent for our 11-day trip to Argentina. For two people! And I am including the cost of two roundtrip international airfares (NYC-EZE) and our domestic airfare within Argentina — three one way flights. We spent some time chatting up the guys who booked our Beagle Channel boat tour. One of the guys was reading a guide about the terrain and animals found on the continent. We learned that the tour world is a small one. Everyone who works at one of the businesses along the waterfront touting trips to the penguin rookery or sailing around the Beagle Channel (we did both) has a friend or a friend of a friend who can alert the others to extra spaces, or possible work, found on the Antarctic-bound ships. These guys needed to be at the ready – with gear and money (if for pleasure and not for work) – because their chance could be the very next day! This entry was posted on Friday, November 4th, 2011 at 8:00 am	and tagged with argentina and posted in travelogues. You can follow any responses to this entry through the RSS 2.0 feed.